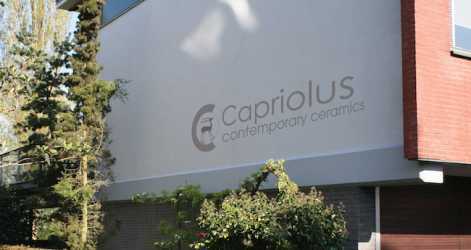 Welcome on the website of Capriolus Contemporary Ceramics. Capriolus Contemporary Ceramics is an online gallery for ceramic art. This business was started in 2000 by Ger J.M. de Ree (1945). Capriolus is the Latin name for De Ree. It is De Ree's passion to share his interest and enthusiasm for the ceramic object - shaped from pliable clay and fired for permanence - with other interested parties. This is why Capriolus devotes a great deal of attention on its site to background information regarding the artists and the ceramics' factories. Particularly where the 20th century ceramic activities are concerned, we are still able - by way of eyewitness accounts - to catalogue experiences, photographs and facts in our database. Through this attention to detail, Capriolus Contemporary Ceramics can be of service to many collectors and other interested parties. Should you be in possession of information and photographs of artists or factories/workshops, would you be kind enough to inform us of this? In our online gallery we offer varied specialisms, from early tin-glazed earthenware up to work by the post-war unica ceramists. On our website we give an as accurate as possible description of these objects. Unfortunately we are not able to present all of our items on the website for your perusal. However, it is possible - by appointment, and under no obligation - to view and handle objects in our home-gallery in Amersfoort. We buy, mediate between collectors and endeavour to have our objects find their way to enthusiastic collectors and museums. During the past years The Rijksmuseum Amsterdam, The Jewish Historical Museum Amsterdam, The Historical Museum Rotterdam, Tiendschuur Tegelen, The Limburg Museum Venlo, Bonnefanten Museum Maastricht, The Netherlands Tile Museum Otterlo, The National Ceramics Museum Princessehof Leeuwarden purchased objects from / through us, as did many private collectors in The Netherlands and abroad.